Construction Section sewn 1/4 leather cover with marble sides. This journal is hand bound in our Melbourne studio incorporating traditional raised bands on the spine with headbands and satin marker ribbon. The decorated papers are hand crafted by master craftsman Robert McLaren. The 190 pages are beautiful cream archival laid paper. 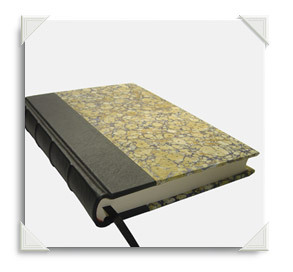 This size makes it ideal for a pocket note book which is ideal for personal use or as a thoughtful gift.